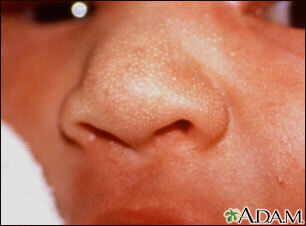 Milia is seen in a newborn infant as tiny, white, elevated spots in the skin. On occasion, there may be a narrow red halo around the base. This is a normal and self-limiting condition of the newborn and disappears over a period of months.